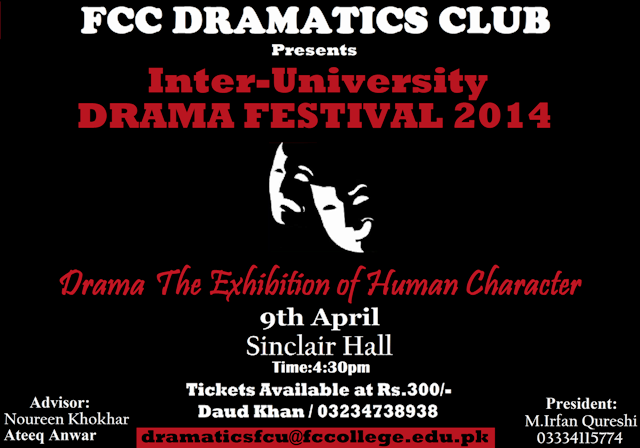 FDC will host the 3rd Inter-University Drama Festival on Wednesday 9 April 2014 in Sinclair Hall. The event consists stage performances from different universities of Lahore, namely, ET, UOL, Superior University, UMT, UCP, USA, BNU, UCOMSATES, PU, NCA, and KC. Food stalls will be placed outside the hall. 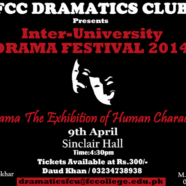 Tickets are available from Wednesday 8 April 2014 for Rs 300 . Please contact Daud at 03234738938 to get the tickets.